This was from an interview I did with Ben Goldstein at Credibly Small Business. When business is slow, many restaurants turn to discounts and coupons in order to get more people through the door. However, discounting is rarely an effective strategy for developing regular customers, and can even end up hurting your business. 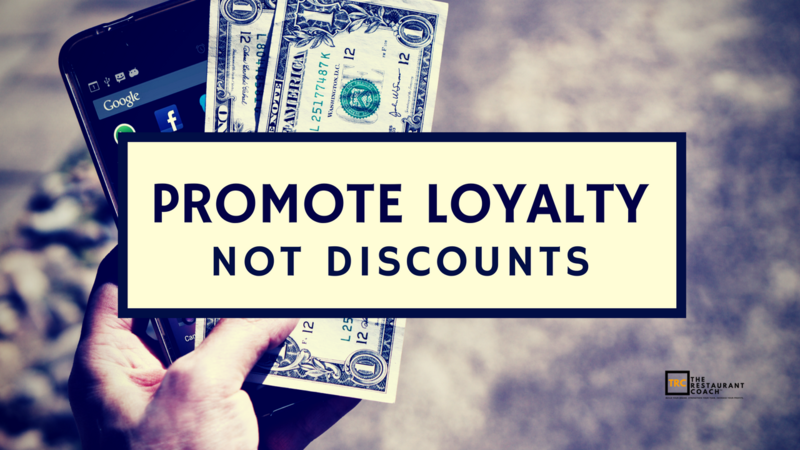 We spoke to Donald Burns (aka The Restaurant Coach™) to learn why loyalty programs are a much wiser path to success than giving away your product. CREDIBLY: What’s the main problem with a restaurant using coupons to attract customers? DONALD BURNS: I find that people who use coupons are loyal only to the coupon. They’re not loyal to the restaurant or the brand, they’re only loyal to the deal they can get. I use this example a lot: Have you ever gone to Apple and gotten a steal on iPhones? Never. Why is that? They think their product is so good that it’s worth every penny. Their price is tied to their reputation. When you discount your product you devalue your brand. CREDIBLY: Is there any scenario for a restaurant owner when using a deal service like Groupon or LivingSocial makes sense? I see a lot of newer businesses do it just to spread the word about themselves. CREDIBLY: I’m reminded of something Shawn Rafferty told me about coupons: “You’re fighting over a group of people that doesn’t actually want to spend money.” Would you say that coupon users are a separate category of consumer altogether? DONALD BURNS: Yes, and it’s a big thing in marketing that we often talk about: psychographics vs. demographics. Demographics refer to your age, if you’re classified as a millennial because of your birth date or something like that. Psychographics relate to your identity. There’s a certain segment of the market that likes to shop at Whole Foods, or out here we have Sprouts. The people who go to Sprouts are loyal to Sprouts because they identify with that place, and it resonates with them. It’s the same thing with restaurants. We go to certain restaurants because of psychographics. We identify with the brand. The thing with discounts is that’s a certain psychographic. Those are people looking for deals. They don’t really care about the quality insomuch as they want a good price. Chains always have those deals, and that’s fine. Let those places fight over that psychographic and that segment of the market, because those customers aren’t loyal to anybody. One week you’ll see them at Applebee’s, and then next week you’ll see them at Chili’s. They bounce around. They’re almost like — I hate to say it — they’re like transients. CREDIBLY: How do loyalty programs work, and what kind of incentives do they offer customers? DONALD BURNS: There are all kinds of loyalty programs. The old classic one was you buy nine drinks or sandwiches and you get one free. That’s kind of a loyalty program, but I like to design them where it’s not about discounting my product. I prefer what we call a preferred status program, or the kind of loyalty program that a hotel or an airline would do. You know how you accumulate mileage points for flying and things like that? A preferred status program might have a three-tier program — silver, gold, and platinum — and every time a customer comes and checks in they start accumulating points. Then, you build up your status. That could lead to incentives like priority seating on a Friday night, or an extended happy hour. Maybe we run our happy hour from 4:00 to 5:00 p.m., but if you’re a platinum member on a preferred status program at my restaurant, your happy hour actually goes until 7:00 p.m. Or, maybe it’s special tasting menus, or exclusive notification of special events like a wine dinner or a guest chef. You’re creating items that I can’t get on your regular menu because they’re actually status symbols. CREDIBLY: So it’s more about creating a better experience for the customer rather than making the product cheaper. DONALD BURNS: Exactly. As another example, most restaurants have good seating areas and bad seating areas. On a Friday night, everyone wants the primo seating. But if you reserve those seats and say, “I’m sorry. Those are for our preferred members.” Well, how do I become a preferred member? Now we’ve got a conversation. CREDIBLY: What’s the most important key to creating a successful restaurant loyalty program? Apps are so much easier because almost everybody has a phone. I can easily pull it up and say, “Okay, I’m here checking in.” You have to make it a seamless experience where it’s easy for people to do business with you. I opened my restaurants back in the ’90s. The Internet was very new back then, it was the old dial-up stuff, and we did it old school. We had a card on everyone that came into our restaurant, especially if we saw them multiple times, and we kept track of information like their names, their spouse’s names, what they liked to drink, what they liked to eat, anniversaries, birthdays. And we used to review those cards. Nowadays with technology, all that stuff is integrated and it’s basically a CRM — a customer relationship management tool — and there are great tools out there that restaurants need to take advantage of that can really enhance the guest experience. CREDIBLY: Are there any tools in particular that you recommend? DONALD BURNS: There’s a really great app called Wisely. They put beacons in the front door of your place just like a location service. If I’m signed up on their program and I walk into your restaurant, as soon as I hit the door, the beacons notify the management team that Donald Burns, platinum member, just walked in the door. Now, you have a chance to create a real custom experience. I like it because there’s no card to carry. I sign up online, I have an app, and when I get to your place, it automatically notifies you. The app keeps track of my points for me, and lets you know where I’m at as far as my status. Most restaurants I go to, I sign in and get my points, and at the end of the meal, no one really mentions that I’m a member of their loyalty program, except for the email I get that says, “You’ve accumulated so many points for your next thing.” It’s not necessarily tailored to me. Wouldn’t it be so great if you had a loyalty program or a preferred status program where, at the end of the meal, someone actually came by and thanked you for being a preferred member — they really appreciate you coming in and knew you by name? The manager or owner walks up to my table and says, “Hey Mr. Burns, I just want to check on how everything was tonight.” Wow! That would just blow me away. That’s how you get loyalty — not by giving me a deal, but by making me feel like I’m a part of your brand. Join my VIP list to receive the latest news and updates. Ready to break free from mediocrity to get the restaurant and life you want? Let's talk! Being Obsessed is the Way!